Please download these files to participate in the PowerPoint Peril workshop. ETS is happy to announce a "Pack and Play" brownbag session on Social Network Analsysis in which Elizabeth Pyatt will introduce general concepts of social network analysis. "Pack and Play" brownbags is a new brownbag event designed to explore different topics and facilitate creativity/problem solving. They are currently being administered by Kate Miffitt (kem32@psu.edu). 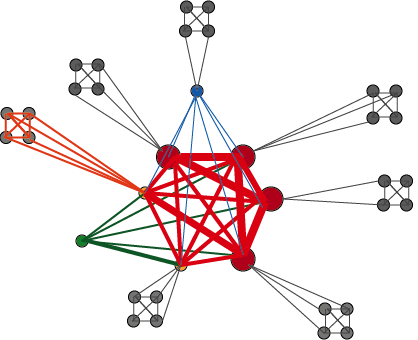 Social network analysis (SNA) is the study of analyzing social connections between individuals and how this contributes to the overall community structure. This session will introduce concepts of social network analysis such as centrality, outliers and brokers and applications of SNA in fields such as sociology, politics, linguistics and epidemology. The session will include a brainstorming discussion of how SNA can be incorporated into educational technology, particularly analytics. Clearing Plagiarism Clouds SP 2013 - Now with better citation examples. Something instructional designers like to do is build in self-check quizzes into online tutorials. It's just a quick way to help learners determine if they are "getting" it or not. Unfortunately interactive elements have been notorious for presenting problems to different audiences. The issue is generally making sure a blind user can see the answer once it's revealed. Fortunately, advances in CSS and browser technology allow one to create better self checks. In fact, I've updated one self-check in a database tutorial so that the answer is disguised in a box where the color the text and background match - until a mouse or tab key hits it to reveal the answer. The answers are visually hidden and revealed based on CSS of the background color. In the "hidden" state, the text and background are the same color and in the revealed state, the colors are different. To enact hover states, the entire answer was placed in a link tag. The crucial parts of the style are display:block (to make the link act like a paragraph box), text-decoration:none and matching the color and background-color attributes. Add padding and margins as needed. Note that it doesn't necessarily "hide" text from blinder users on a screen reader, but since text is presented in linear order, that is not as serious an issue as it could be IMHO. I would however ensure that 1) the question is an H tag and that the answer text in the link begin with "Answer". And then you can hush the screen reader. To reveal the answer, it's important to create an appropriate CSS for BOTH the a:hover (mouseover) and a:focus (keyboard focus). Here is the CSS below. Assuming the answer is in a link, most browsers will allow you to tab right to the answer and hit ENTER or the DOWN ARROW (Chrome) to reveal the answer. But what about the question? You could embed the question in a link, but another option is to embedd the tabindex="0" attribute in whatever tag the question lives in (it could be an H tag or P tag). The Tab Index is a signal to "stop here", but setting the value to "0" doesn't make any changes to order. You can also add a tabindex to the answer, but since I buried it in A tag to use its hover effects, it's redundant. So let's look at the HTML for this. A few years ago, the Chronicle of Higher Education published a story that would scare the tweed socks off of any professor - the Shadow Scholar who writes custom essays allowing students to graduate with advanced degrees illicitly earned. The Shadow Scholar goes on to comment that HE (or SHE) is getting paid to learn about these topics in order to write these quality essays. The scariest part of course is that if the writing is good enough, not even Turnitin could detect the cheating because it's a custom, well-written essay....or is it? Economist Dan Ariely has an interesting article in which he test drives a few essay services and finds less than satisfying results. Consider some of the issues he finds in these essays (for which he paid over $150). May include plagiarized content - the kind detectable by Turnitin. I don't mean to say that the Shadow Scholar ever produced such shoddy results. But the Shadow Scholar may be starting to charge a much higher fee after this. I also don't mean to say that faculty can breath a sigh of relief. Students are still going to do what they do, and they need to be educated otherwise. There is harmless healing, when healers-cheaters and wizards offer omens, lapels, damage to withdraw, the husband-wife back and stuff. ... But these days fewer people believe in wizards. "But I don't want deep learning"
An important tenet of constructivism is how important it is to build your own meaning by analyzing, discussing and reviewing data and issues from multiple perspectives. It is the path to the highest enlightenment in any topic. But what do instructional designers do? Distill important pedagogical topics and technology down to a simple list of tips for our client faculty. It's far from being constructivist and can lead to some misconceptions. But it's what our customers want. Not so different from undergraduate students. Before we hang our heads in shame though, consider the factors of time and motivation. Deep learning is going take longer than the checklist un-deep learning, and there isn't always a visible payoff. And if there isn't a visible payoff, then you need to be interest....really, really interested. So consider a topic everyone loves - the spelling rules of English. Traditionally this is taught as memorizing complicated lists or rules and vocabulary lists. Were you bored? I know I was. Were you confused? You should be. Even after getting multiple degrees in linguist, there are words that I have trouble spelling. It turns out that there is another way to learn spelling - learn how to spell other languages particularly Latin, French, Greek, Italian and German. But adding Spanish, Chinese, Japanese, Sanskrit, Arabic and a variety of African languages is also useful. For place names you should also add Dutch, Welsh, Irish and some native American languages. Once I learned the spelling rules of these languages, my spelling improved considerably. That's because English adopts words with foreign spellings (vs. sensible languages like Welsh which change spelling to fit its phonetic spelling system). How long did this take? At least four years to get all the Latin, French and Spanish in. After that each language is a lot quicker (about one semester max). In addition to improving my spelling, learning other languages (even a little bit) has been great for helping me understand history, the news, cooking, music theory and art. That actually IS a visible payoff. And yet, I hear all the time how hard a foreign language is. ¿Quién quiere «deep learning» ahora? It's all so sad. You know, I didn't know I was going to have any words of wisdom until I started pulling this blog entry together, but through the power of metacognition, I have some to deliver. One is to learn to be interested. Once upon a time, there were topics I found boring and incomprehensible...until I started learning more. They included spelling, accessibility, copyright law, economics, thermodynamics, nutrition, Egyptian mummies, Stonehenge, bees and many more. But as I read more, I realized they were interesting. Strange but true. There are topics I still find "boring", but it's because I've been too lazy to investigate. Or I need to get some sleep. From the the instructional side, I think the lesson is to be interesting. Most of us already know this, but it's important to remind ourselves of this from time to time. Anytime we dismiss our courses in accounting, statistics, or whatnot as "boring", we've lost our battle. One corollary of this is that our instructors should be INTERESTED. Drafting instructors to teach something they are not currently passionate in leads to a lot of wasted time. Do they always have time to catch up before the students? Do they want to? Do you? But the biggest question of all - do our students have the time? They should of course, but when I consider how many times I am asked to distill a complicated subject to a three-bullet point list, I can't blame them for acting just like busy adults. Monkey see, monkey do is still a valid learning pattern. Sometimes, the checklist is the best we can do. I was also able to get MathML to display in Drupal, at least on the AccessAbility Web site. The key for Drupal is to make sure that the Input Format is set for Full HTML. See the ANGEL and MathML entry for information getting the appropriate namespace version of MathML. Possible Improvement in Speech Recognition? One of the challenges of video captioning is that it does rely human intervention to achieve the most accurate results. That's because speech recognition is only reliable in certain circumstances, usually when the speaker has set up a profile on a Dragon speech recognition engine (this could include instructors BTW). Note that all of the above assume that someone is spending time re-watching the video. Ugh! Could an Easy Button be Coming? What we are all waiting for is the captioning "Easy Button" that will allow use to upload any video file and presto - get back a reasonably accurate transcription regardless of the speaker. The good news is that Norwegian University of Science and Technology (NTNU) has been working on new speech recognition algorithms. Unlike previous systems, it appears that this one will include a little more old-fashioned phonetic and phonological information and won't be quite as reliant on statistical models. It still might not be perfect. As with current systems, you will need high quality recordings so the right amount of phonetic information can be retrieved. I suspect that any speaker outside known linguistic parameters (e.g. a speaker with an undocumented accent) will still be able to throw off the system. But I am glad that linguistics is being included in the solution. I've been exploring the Grademark tools in Turnitin which includes comments and realized that they could that comments could maybe be....Badges. Just to briefly describe the tool, Grademark allows instructor to drag comments onto a paper (like the well-known "¶" and "Awk." comments of writing instructors. However, this tool allows instructors to create their own comments, and this is where badgification could come in. Suppose I am teaching a linguistics course and want to reward the extra effort in a piece of linguistic writing. I could use light hearted comments to reward students for going the extra mile. For instance, if a student included non-English data with the correct accent marks or in an authentic script, they could get the "Script Master" badge, while those who record audio could get a "Podcaster" badge. It's not a full badge system, but it's a way to leverage a feedback system to be a little more badge like.